This is a new grant for 2013, and we are collaborating with John Witter (Witter.7@osu.edu). Our Piketon team for this grant is helping by collecting and analyzing samples. This a five year grant for us in Piketon that was established in the fall of 2011. This grant looks at plots that are being subjected to continuous soybean planting. We have three different plot areas continuous soybeans, and then two plots that are alternating corn and soybean rotations. For this grant we are looking at improving soil for soybean production, and one of the minerals we have found that has possibility of this is zeolite. A few of the parameters we are looking at to help in this grant is infiltration rates, soil aggregates, greenhouse gasses, and nitrogen fixation. 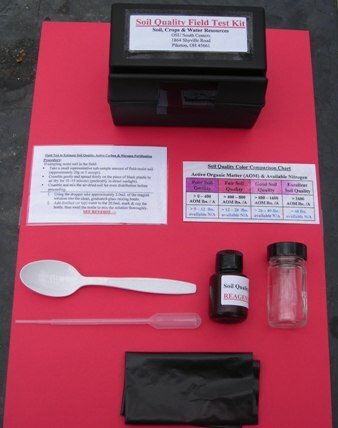 This grant allows us to make and train indviduals with our easy to use soil quality field test kit developed by Dr. Rafiq Islam. 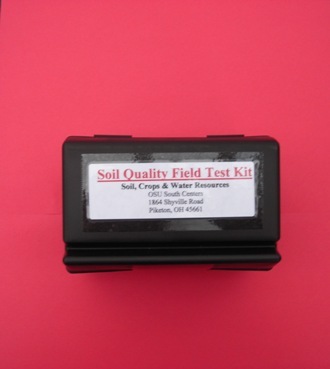 For more details and to order a soil quality field test kit, click here. Removal of crop residue for biofuels and other purposes is becoming a common practice in the Midwest. However, removal of crop residue adversely impacts the stability of soil organic matter (SOM) stock in the soil. Therefore, there is a growing interest among farmers, crop consultants and bio-energy related industry for a tool that can help them optimize their management practices and crop residue removal rates, while maintaining a good soil health in the long term. The SOM Calculator consists of a user-friendly interface, with options to select crop rotation, management practices (conservation tillage, drainage, manure application etc. ), and residue removal rates per year. Based on these inputs, the calculator uses first order decay functions as primary basis for calculating annual changes in SOM over short- and long-term. The calculator has been further expanded to predict active and passive fractions of SOM, total active nitrogen and overall soil quality. The calculator is also capable of calculating the revenue generated from residue removal, percent change in SOM and corresponding amount of soil carbon sequestered or lost. Data from long-term trials in Ohio and Michigan will be used to broaden the spatial validity of the calculator.